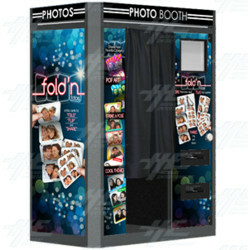 Fantasy Entertainment's Fold'N Foto Photo Booth uses unique graphic themes and trading card style photo print outs, so that every person who poses leaves with something extra special! The unique graphic themes include Love, Freinds, Holidays, full spectrum Pop Art and Tie Dye, while the interactive program “Strike a Pose” prompts the user experience so that you get a great photo every shot! Users can watch a video instant replay at the booth while waiting for photos to print for a bit of extra fun. Once photos are printed, the photos can be folded into 4 trading cards or used as 8 large stickers, which you can then give to friends, family or loved ones. The unique graphic themes include Love, Freinds, Holidays, full spectrum Pop Art and Tie Dye, while the interactive program “Strike a Pose” prompts the user experience so that you get a great photo every shot! Users can watch a video instant replay at the booth while waiting for photos to print for a bit of extra fun. Once photos are printed, the photos can be folded into 4 trading cards or used as 8 large stickers, which you can then give to friends, family or loved ones.